I was intrigued by the 2015 release of David Talbot’s The Devil’s Chessboard: Allen Dulles, the CIA, and the Rise of America’s Secret Government. But it also reminded me of a 2014 book I had been wanting to read titled The Brothers: John Foster Dulles, Allen Dulles, and Their Secret World War by Stephen Kinzer. Since the earlier book covered both important brothers — the younger Allen who was Director of Central Intelligence and the elder John Foster who was Secretary of State — I decided to go with Kinzer. As it turned out, I was so fascinated by Kinzer’s discussion of the Dulleses that after finishing The Brothers, I dove right into Talbot’s The Devil’s Chessboard. I am so glad that I did. While there is some unavoidable overlap, reading the two books in quick succession is not at all redundant. In fact, they are such splendid complements of each other, that one almost wonders if the two authors coordinated. Both books are essential reading to understand, not only these two fascinating figures, but the U.S. itself from the post-World War II era to today. 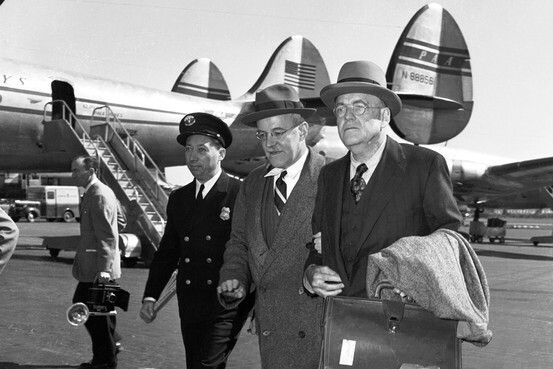 The Dulles brothers rose to power at a pivotal moment in American history. The great nations of Europe and East Asia were devastated by the War and for the most part lay prostrate at the feet of the American collossus. Together John Foster and Allen seized the day and fastened the U.S. government upon the world as a hyperactive, ruthless empire committed to perpetual war. In doing so, they also helped fasten an equally hyperactive and ruthless garrison state upon the American people themselves. This interventionism was framed under the rubric of the Cold War: an all-encompassing struggle pitting the “forces of freedom” against revolutionary communism and Soviet imperialism. In reality it was all about Washington’s own global hegemony, which was advanced especially for the sake of the elite corporate interests that the Dulles brothers had served all throughout their careers. As the nation’s top diplomat, John Foster established implacable hostility toward the communist bloc as an unshakable tenet of U.S. foreign policy. And for him, even worse than the communists were the “neutralists” who “immorally” refrained from picking sides in the Cold War. These neutralists were even more of a threat because they threatened to defuse what he saw as a necessary conflict. Thus he framed the diverse anti-colonial independence movement sweeping the third world after World War II as little more than a communist plot. It was Allen’s CIA that gave teeth to his brother’s policy. Allen completed the transformation of the agency from the intelligence clearinghouse envisioned by President Harry Truman to the clandestine paramilitary force that it is today. This transition was deliberately enabled by President Dwight D. Eisenhower who saw covert action as a relatively bloodless way to achieve geopolitical aims. In this estimation, he did not factor the blood of foreigners that spilled amid the chaos his interventions engendered. Kinzer is more thorough than Talbot about the brothers’ childhood and early career, telling of the formative influence of their diplomat grandfather John Watson Foster, as well as the brothers’ years in private law practice as international fixers and power brokers for the American corporate elite. Kinzer also goes into more detail about the politics, the personalities, and the plight of the countries targeted by the Dulles’s for regime change. However, Talbot is more complete than Kinzer regarding Allen’s dark doings. He goes into far more horrifying detail about Project MKUltra (the CIA torture/mind control program). He relates whole stories missed by Kinzer about Allen’s collaboration with Nazi war criminals. And he delves deeply into the issue of Allen’s possible involvement in the Kennedy assassination, which Kinzer only briefly mentions. Scholarly Kinzer’s chief weakness is a certain lack of cynicism about the Dulleses and what drives them, especially in his concluding passages. Talbot, on the other hand, brilliantly cites C. Wright Mills to depict John Foster as an unctuous servant of the power elite, and perceptively cites Carl Jung to analyze Allen (who actually was psychoanalyzed by Jung) as a manipulative sociopath. Left-liberal Talbot’s chief weakness is his rather evident fondness for Democratic presidents (especially Franklin D. Roosevelt) which mars several chapters. For example, Talbot’s indictment of Allen’s World War II career rings less true than his other critiques because it largely rests on his agreement with FDR’s monstrous war-extending insistence on unconditional surrender. Together, the Dulles brothers inaugurated the perpetual war that has extended from the Cold War to today’s Terror War. It is a vitally important tale, and one masterfully told by both Kinzer and Talbot.